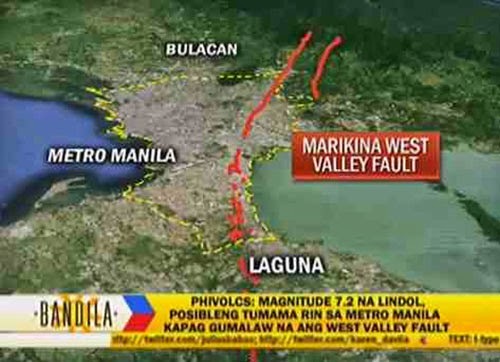 Six schools around Metro Manila and nearby provinces have been confirmed and identified that it is built near and on top of the West Valley Fault according to Philippine Institute of Volcanology and Seismology (PHIVOLCS). Renato Solidum Jr., PHIVOLCS director said that it must be abandoned and or demolished for the safety of the students, parents and teachers if ever the a massive earthquake hits the fault. Solidum said, "They need to transfer the kids...It's not that many. They need to discuss it with [the Department of Education] and school officials. Essentially, they are putting students at risk. To be fair, we don't know when the fault will move," and added, "It's like gambling with their lives." As PHIVOLCS introduced the new system 'VFS' or the Valley Fault System Atlas, they have also warned again all the areas, barangays, schools and even LGU's on what may be the outcome if an earthquake came to happen. That it why, the bureau finally listed out the six schools that may directly hit if ever an earthquake goes by one of this days. Solidum advised that the affected schools must not use the rooms and even the offices for the safety of everyone. He said, "The affected schools must make sure they do not use the rooms for classes or offices. We have advised them not to. They can use this for storage spaces or strengthen the demolished part of the building if it's like a very long building. Demolish the part transected by the fault and reinforce the sides of the building which is away from the buffer zone or demolish the whole building totally." Comments or suggestions about "Six Schools built on top of West Valley Fault" is important to us, you may share it by using the comment box below.